Being the influential techno gods they are, Kraftwerk are basically allowed to make a comeback if they wish. I mean, without them we wouldn't have, well, any electronic music. Since it's been well over a decade since they've released a full-length album, one must question why they are back now after such a long time. 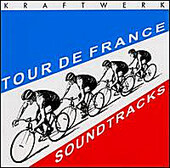 They recently released a remixed and reduxed version of their 1983 "Tour De France" single, which served a purpose, considering the event had celebrated its 100th birthday this year. Tour De France Soundtracks is an entire album of Kraftwerk still pushing their original sound and with four takes of the title track to boot. Overkill of that one track might be a tad harsh on the listener, but really, it's what lies elsewhere that makes Soundtracks a rewarding experience. "Vitamin" avoids the cycling circuit and delves into a funkier, virtual world and "Titanium" shows just how much of a fan Richard D. James is of these pioneers, strutting their own style of selected ambient works. What lies to be the centerpiece of album is the slick yet expressionless "Elektro Kardiogramm", which pumps a breathless beat that leaves you awestruck. Things may not have changed for the German wizards over the past 30 years, but they're still as relevant today as they were back when they were the only computer geeks around pushing this kind of music.